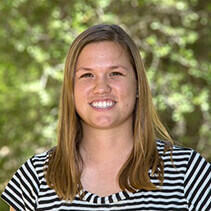 Michelle Curtis serves San Diego Zoo Global as a Senior Research Associate in Recovery Ecology. In this role, she is responsible for the daily care and management of the our mountain yellow-legged frog breeding colony, reintroduction of froglets and tadpoles to the wild, post-release field monitoring, assisting with outreach materials, collecting data for various research projects, troubleshooting tank equipment, and additional tasks needed to keep the laboratory up and running smoothly. Michelle has prior field experience with wide range of animals, including insects, golden eagles, amphibians, reptiles, crocodilians, and small mammals. Michelle earned her bachelor’s degree in Environmental Horticulture from the University of Florida and is currently perusing her master’s degree in Biology through Miami University and San Diego Zoo Global. She first fell in love with ecology and conservation when she accepted a job with U.S. Fish and Wildlife Service and the University of Florida Invasive Species Laboratory. Her work there focused largely on South Florida crocodilian population monitoring and ecology, and invasive exotic wildlife monitoring and removal. She is thrilled to be in San Diego, but still misses airboat rides in the marsh and all the species that call it home.